Announcement The NEW Super 6 Lane Raceway Extension Kit for Hot Wheels track is now available. Extend your current track out and up for longer drag races and exciting monster truck action. 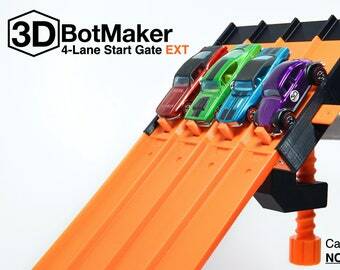 The NEW Super 6 Lane Raceway Extension Kit for Hot Wheels track is now available. Extend your current track out and up for longer drag races and exciting monster truck action. 2nd or 3rd order from 3DBotMaker - items work flawlessly. I received this a couple of weeks ago and just had a chance to hook it up yesterday. It worked flawlessly. It would be cool if you could hook it up to your TV to display the numbers for all to see, just a suggestion. 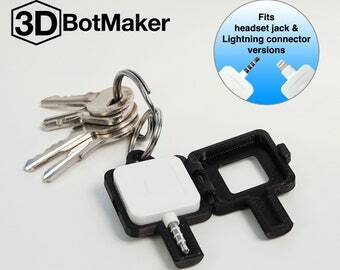 Great item- I would definitely recommend. 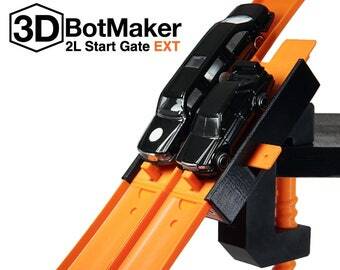 Welcome to the 3DBotMaker store, the home of 1:64 diecast hot wheels racing accessories. Returns accepted within 30-days of delivery. Item must be in original condition. Buyer pays for return shipping. International Customers: Please be aware that packages shipped from outside of your country will have to be processed through your country's customs department. This process will add to the delivery time, sometimes up to a few weeks. Depending on your country, you may also be charged a customs fee/duty for importing non-domestic goods. This fee is a tax and is separate from the shipping fee paid at checkout. If you have any questions, please contact your local postal department.